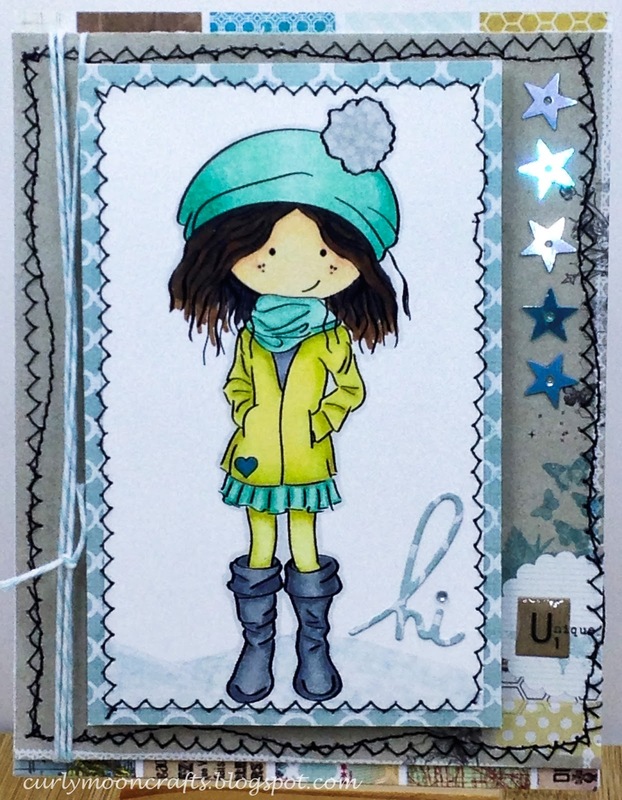 My creation for this week is a winter hello card using the digital stamp Winter Peggy. I printed the image onto smooth white cardstock and colored her with my Spectrum Noir markers. I added some glitter brush pen to the snow on the ground. I cut my background papers to fit the A2 card base and image then sewed them with my sewing machine. I added the baker's twine to the center panel and attached the papers to my card base. For added dimension, I used foam squares to pop the focal panel off the page. I cut the sentiment from the same papers and added it to the focal panel - I used a gem to dot the "i" because I somehow lost that little tiny paper dot. LOL. I used some Glossy Accents on the "U" in the background paper, then finished off with some star sequins.